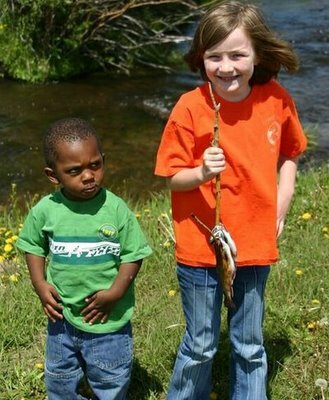 A little boy looking very angry and jealous over a little girl who caught a fish. Hahahaha, the look on that kid's face is priceless. Too funny! One of things is not like hte other,,, not like the other,,, not like the other,,, one of these things is not like the other. Whoa! The young 'un has perfected the Death Stare already. I'm sensing just a wee bit of hostility there. btw... Thanks for stopping by my blog!